Shri. Debabrata Patra, Regional Manager, ActionAid Bhubaneswar gave a clarity on how Actionaid reaching to the last community to bring up their issues on limelight and to give them justice whether its super cyclones or daily deprivations. But the work should be fact based i.e case studies which has greater impact on media as well as common people and most importantly the Government. Shri. 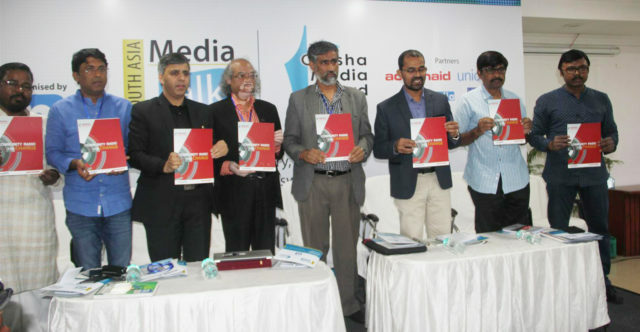 Sudhir Pattnaik, Editor, Samadrusti in his excellent speech opined that “Democracy is least important today and media is a part of corporate world now”. He also said that the GDP of the state or nation never counts labourer’s labour, so calling it economic development is foolish. Dichotomy between state and society is increasing day by day which has no good result on Media, so there is need of hour for cooperation and federation of all houses from Civil society to media. In the Odisha Media Award ceremony 20 awardees are felicited in 17 categories. In print category, Bamapada Tripathy, editor, Samaj felicited with Editor of the Year by Odisha Media Award and Dr. Santosh Kumar Mohapatra as Columnist of the Year. In Television Category, Bada Khabar (Prameya News 7) awarded as Best Television Show (Current Affairs), Rajashree Sahoo (Otv) as Best News Presenter. In Radio Category Anitya Mohanty, AIR Cuttack, felicited as Best Radio Presenter. In common category, Anuj Kumar Das as Best Reporter (People’s Issue Reporting), Bibhuti pati as Best Reporter (Developmental Reporting), Amjad Badshah as Best Reporter (Developmental Reporting), Aiswarya Parija as Best Reporter (Gender Issue Reporting) are felicited. Best Reporters award for Community Reporting have given to four awardees like Jitendra Beura (Malkangiri), Sisir Panigrahi (Brahmapur), Bijaya Dwibedi (Bhawani Patna) and Swadhin Meher (Sonepur). In Special Category, BJB (A) College bags Best Media Institution Award. Rashmi Ranjan Parida, Founder & Director, Odisha Diary Foundation awarded as Inspiring Young New Media Entrepreneur. Gyanendra Ratha was awarded as Cartoon Journalist of the year. 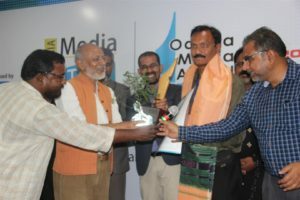 Asit Kumar Satapathy awarded as Photo Journalist of the Year, “Ghar Jana Hai” as Best People’s Cause Documentary, Omm.Com News as Best use of New Media and Samanya Kathan as Best Blog of the Year.